Do you have an IELTS certificate? Get the TrackTest CEFR English test for free. The International English Language Testing System (IELTS) is a test that measures the language proficiency of people who want to study or work in environments where English is used as a language of communication. It is managed by the British Council, IELTS Australia and Cambridge English Language Assessment. It was established in 1989. IELTS is available in two test formats – Academic or General Training and provides an assessment of the four language skills: listening, reading, writing and speaking. The difference between the Academic and General Training versions is the content. All other features- time limits, responses length and scores are the same. IELTS uses 9-band scale, from non-user (band score 1) through to expert (band score 9). 8- Very Good User, 9- Expert User (similar to C2 level). An official result in the form of Test Report Form is posted to test takers 13 days after their test. It is valid for 2 years. The test total time is 2 hours and 45 minutes (Listening 30 minutes, Reading 60 minutes, Writing 60 minutes, Speaking 11–14 minutes). It needs to be taken in one of the authorised test centres. Price for one IELTS test is approx. 190 EUR. 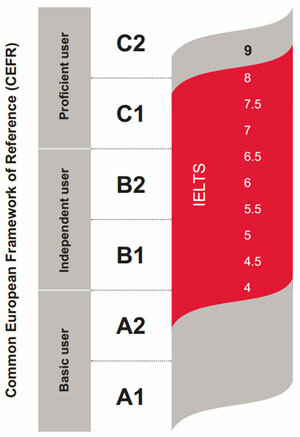 TrackTest uses standardised 6 CEFR levels (A1 to C2). Results and language certificates are available immediately after the completion of the level tests. Evaluation of the optional English speaking test is delivered 6 days after the test completion. The TrackTest English certificate is valid for lifetime. TrackTest level tests take usually up to 45 minutes, extra 20 minutes with the Speaking&Writing test. It is delivered online. It can be taken anywhere (unless the assessing institution requires your on-site presence). TrackTest access to all English proficiency level tests costs 10x less. During 12 months, you may repeat the same level multiple times after 30 days. See what else is included in the licence price. Results available After 13 days Immediately (the Speaking&Writing after 6 days). Do you have an IELTS exam? Get the TrackTest CEFR English test for free.